” Our clients always wanted a comfortable winter coat with sleeves wide enough to wear over their business suits.” Says Jamak Khazra. The Cape Coat has no sleeves so by design cape coats are perfect to wear over your business suits. 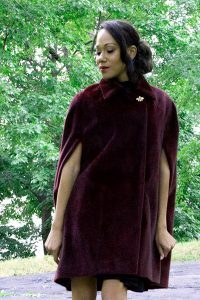 Bluesuits Cape Coat Collection Features Several Colors and Fabrications including Faux Furs, Wool, Double face wool and Cashmere Coats in Single breast or Double breasted styles. Featured on the left is Bluesuits Red Cashmere Double Breasted Cape Coat with Leopard Print Collar. We think this style wins over Peacoats, bomber jackets or puffer jackets. You will also see the Faux Persian Lamb Cape Coat, The Burgandy Faux Fur and the Green Faux fur cape coats in Bluesuits collection of winter coats for women.